Since its founding in 1992, Carleton University Art Gallery has built and cared for the University’s art collection as a rich resource for discovery, research, and learning through the direct experience of original works of art. To mark the gallery’s 20th anniversary, we are presenting An Embarrassment of Riches, a major exhibition that will occupy the entire gallery and focus on art acquired by donation and purchase since 2006. 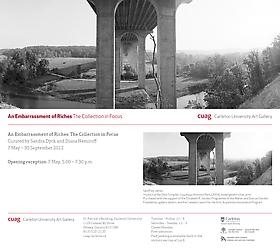 The exhibition includes an impressive core of contemporary photography by such artists as Robert Bourdeau, Justin Wonnacott, Jocelyne Alloucherie, Charles Gagnon, Lorraine Gilbert, Geoffrey James, and Michael Schreier. Videos presented include Kent Monkman’s cheeky Dance to Miss Chief and Zacharias Kunuk’s epic Nunavut series. The printmakers featured span centuries and continents – from Lucas van Leyden and Hans Sebald Beham to Clarence Gagnon and John J.A. Murphy to Pitseolak Ashoona and Ibrahim Miranda Ramos. Delicate drawings by Ivan Eyre, Jane Martin, Kananginak Pootoogook, and Ron Bloore act as a quiet counterpoint to the Pop-inspired work of Michèle Provost and Cynthia Girard, and a group of vividly-coloured 18th-century Indian Ragamala miniatures. The diverse sculptures featured include Liz Magor’s handy Tool Kit, several Haida argillite carvings of the 19th century, and Gunter Nolte’s minimalist steel piece, Step Up and Over.